In this case, the models and observations have been plotted so that their respective 1979-2012 trend lines all intersect in 1979, which we believe is the most meaningful way to simultaneously plot the models’ results for comparison to the observations. In my opinion, the day of reckoning has arrived. The modellers and the IPCC have willingly ignored the evidence for low climate sensitivity for many years, despite the fact that some of us have shown that simply confusing cause and effect when examining cloud and temperature variations can totally mislead you on cloud feedbacks (e.g. Spencer & Braswell, 2010). 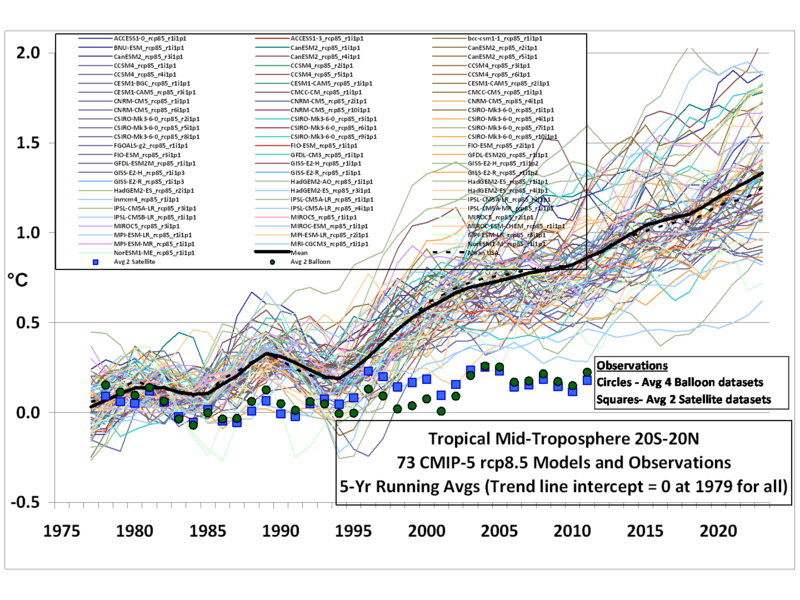 The discrepancy between models and observations is not a new issue…just one that is becoming more glaring over time. It will be interesting to see how all of this plays out in the coming years. I frankly don’t see how the IPCC can keep claiming that the models are “not inconsistent with” the observations. Any sane person can see otherwise. If the observations in the above graph were on the UPPER (warm) side of the models, do you really believe the modelers would not be falling all over themselves to see how much additional surface warming they could get their models to produce? Hundreds of millions of dollars that have gone into the expensive climate modelling enterprise has all but destroyed governmental funding of research into natural sources of climate change. For years the modelers have maintained that there is no such thing as natural climate change…yet they now, ironically, have to invoke natural climate forces to explain why surface warming has essentially stopped in the last 15 years! Forgive me if I sound frustrated, but we scientists who still believe that climate change can also be naturally forced have been virtually cut out of funding and publication by the ‘humans-cause-everything-bad-that-happens’ juggernaut. The public who funds their work will not stand for their willful blindness much longer.